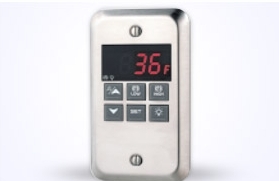 Operators can be certain that the temperature inside their walk-in stays in the safe zone by indicating either a High or Low Temperature condition with a visual Alarm and pulsing Buzzer. An open door alarm keeps the cold inside where it belongs. A set of Alarm contacts is included for outboard signaling. The Light Management System will automatically turn the lights ON when you open the door and the "AUTO-OFF" feature shuts off the light after an adjustable time delay. 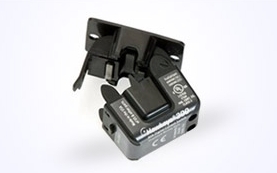 Optional 9Vdc battery back up will allow for visual alarms for up to 96 hours. 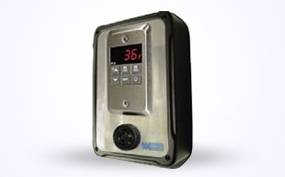 Gas leak detector for refrigerant leaks. Various gases/ranges available. Strobe light for visual alarm warning. Push-button backlight panic alarm. The XWA will display "Pan" and turn on alarm relay for external buzzer or phone dialer. Current transformer to detect defrost. The DixelI XW60K Walk-in controller provides an electronic solution for both temperature and low temperature walk-in units. The XW60K features On-Demand® Defrost, Energy Saver Mode, Hands Free auto-off lights, Fan Cycling, Remote Keypad, and includes digital inputs for door ajar switches and other interfaces. Alarms include High and Low temps, door and condenser alarms. Energy Savings can be up to 20-25%.